An NBA game-day group shooting drill, each player has a ball, coaches are passers, shooters rebound their shots and return to their lines. 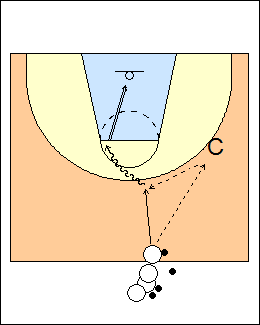 On one side, baseline shooters curl and fade for 2-point and 3-point shots, then coach will move out to the wing (foul-line extended), shooters cut up the middle for shots at the foul line, inside the arc, then behind the arc. See Shooting - Lee Rose guards, Bill Self perimeter, also Procopio game shots. See Shooting - 5star transition, Memphis guards, Duke transition, 6-shot series, Give and go. Each group shoots inside (baseline) and perimeter shots on one side of the floor, then switch sides. 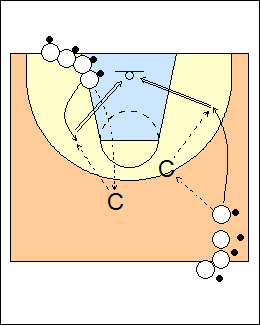 While one coach works with inside players on their post moves (at the other end), another coach moves to the foul-line extended and works on perimeter shooting, players pass to coach from midcourt, use the same sequence as sideline shooting above. See Shooting - Kevin O'Neill on the move, Kelbick quick shot, Fast-break.